The No. 21 Utah Utes volleyball team (15-6, 6-4 Pac-12) hits the road this weekend to travel to Los Angeles to face the No. 24 USC Trojans (14-7, 6-4 Pac-12) and the No. 12 UCLA Bruins (16-4, 7-3 Pac-12). The two road matches will be the fifth and sixth out of the last eight that the Utes have played away from the Huntsman Center, but Utah has enjoyed success on the road, sporting a 7-1 record in road matches compared to a 5-4 record at home. “There’s a feeling of comfort knowing the team going in and we’ll work on things that they beat us on last time we played them,” said head coach Beth Launiere. The Utes open the road swing traveling to California on Friday to face the No. 12 UCLA Bruins, who are on a four match winning streak. One player to watch for the Bruins is Jordan Anderson, who leads UCLA with 242 kills on the season, and a .220 hitting percentage. “They have great talent in every position,” Launiere said. As a team, the Bruins are out-killing their opponents 1,099 to 937, and have committed 88 less errors on the season vs. their opponents. UCLA’s opponents have hit just .162. 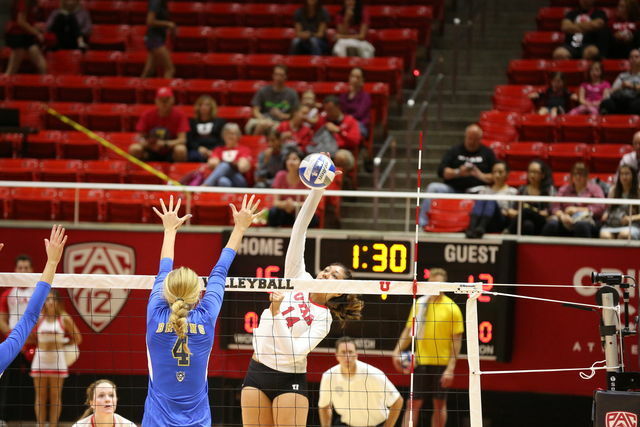 But Utah also has offensive prowess as it averages 14.06 kills per set. UCLA leads the Pac-12 in digs, averaging 18.1 per set. On Sunday, Utah will face the USC Trojans. USC comes into the match having won three out of its last four matches, but it enters the match against Utah on a one match losing streak, having lost to Stanford 3-0 in its last outing. Leading Southern California is Khalia Lanier, who has 299 kills on the season. Utah has played the Trojans once before. It lost in five sets, 3-2. Utah senior Tess Sutton said the game plan for the Utes going into Los Angeles is to start and end strong. Launiere said that in preparation for USC and UCLA, the Utes are focusing on what they can do to win the game. UCLA is currently sitting in second place in the Pac-12. Utah is in sixth place, and USC is right behind the Utes in seventh place in the conference.